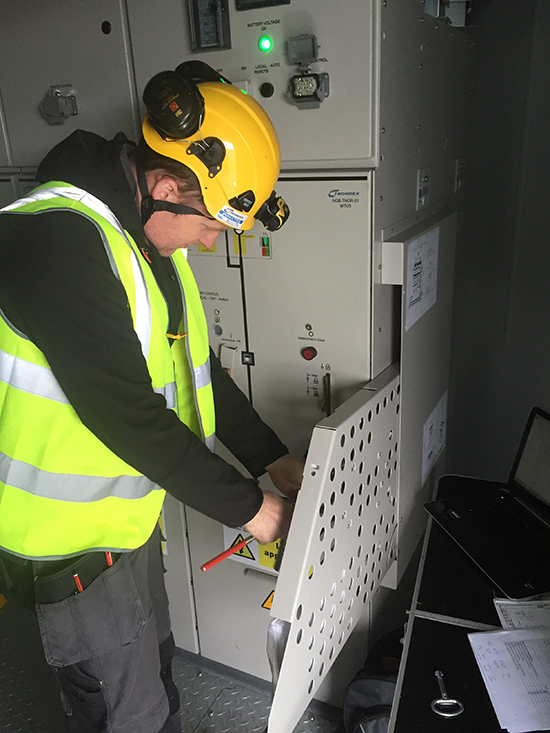 Horan Power Engineering operate a high voltage control room on behalf of Nordex. We have trained and authorised over 100 of their personnel, and it is our responsibility to ensure they operate in a safe way. We review and approve switching procedures for pre-planned works and provide technical support and emergency support for all Nordex high voltage staff. A live website shows the status of the high voltage network on all 25 high voltage networks we manage and provides a library of useful information and previously approved schedules that is available to all authorised staff. Through this system we have approved over 1000 switching schedules and appointed over 100 Senior Authorised Persons, and the service has been extended to other clients as well as Nordex. Our high voltage control room works to high voltage rules and systems that would be familiar to most distribution network operators in the UK. We see no need to ‘water down’ the safety standards for high voltage working in wind. However, authorisations for wind farm operators are restricted to simple wind farm networks, and this allows the amount of training and experience to be optimised. In addition experienced engineers in the high voltage control room check and approve all switching operations (both planned and unplanned) and provide a safety net that allows less skilled Senior Authorised Persons to operate safely in the field.